The baldness and alopecia are the alternative terms to hair loss, these describe the hair fall from body or head. The hair loss is prevalent in both men and women with different conditions while some causes are clear while some still need to reveal. The different hair treatment exists and useful for the hair enrichment. Hair grows naturally on the body, some people have more here and some have fewer hairs. Only the two body place where here not exist the hands’ palms and the sole side of your feet. The keratin is the main protein element used in the hair made up. The external layer of the skin is known as the follicles that produce the keratin. According to an analysis every adult has hair on his body between 100,000 to 150,000 and averagely daily hair loss is 100. Similarly, the hair growth on the men or women body is 90% at any given time. You can daily see hair fall while washing your face, head or teeth but is not dangerous because it is a routine matter. However, too much hair fall, if you are experiencing, is a real danger for you. Are you experiencing with hair loss? Majority of the people, at some life stage, meet with a fearful red signal of hair loss. Our hair starts falling and we are still thinking about what to do or what not? So, how to stop hair fall immediately? If you are experiencing the problem of hair loss then start searching for the problem that is causing hair fall? Let us skip these natural phenomena’s and meanwhile we are focusing on the spectacles’ behind hair loss, talk over hair fall happening and how the hair growth occurs. 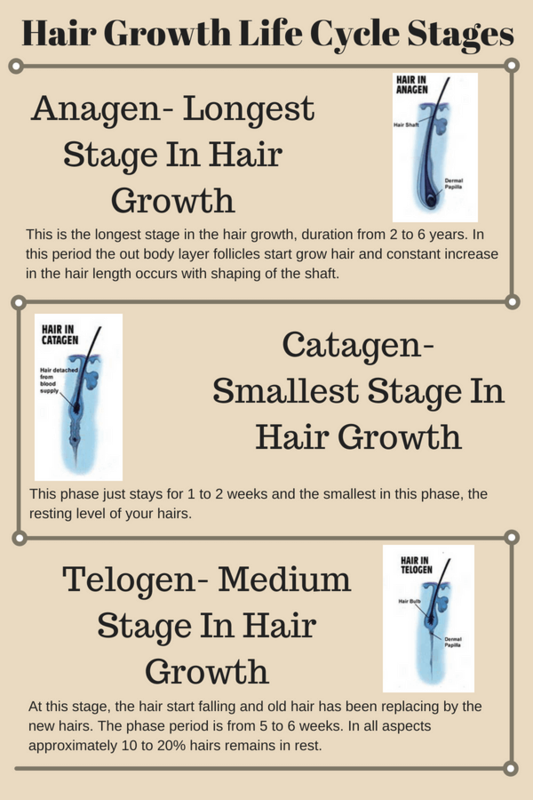 The hair growth stages span over 3 to 5 years period and after this time the hairs start falling and new hairs take place. How to stop hair loss during this period read below. This is the longest stage in the hair growth, duration from 2 to 6 years. In this period the out body layer follicles start to grow hair and constant increase in the hair length occurs with the shaping of the shaft. This phase just stays for 1 to 2 weeks and the smallest in this phase, the resting level of your hairs. At this stage, the hair starts falling and old hair has been replacing by the new hairs. The phase period is from 5 to 6 weeks. In all aspects, approximately 10 to 20% hairs remain in rest. There is a difference between permanent hair loss and hair fall. The hair fall occurs after completing the 3 level of the above cycle and permanent hair fall occurs after the when the external body layer names as follicle stop producing the hair. Hair fall is one of the leading hair concern globally. This epidemic of hair loss is shattering the confidence of countless men n women. There are enormous reasons for hair loss. Causes of hair loss differ from one individual to another. Some people face hair loss due to external factors, and some have internal issues. Internally it could be any physiological disorder like hormonal issue any medical problem, malnutrition. External factors like chemical abuse, heat styling, and weather can lead to hair fall and eventually baldness. Identifying the root cause of hair fall can stop hair fall immediately. Here we are listing down some of the primary reasons for hair fall in women. Genes play the most significant role in determining your hair type and hair texture. Hair loss is also something that transfers from parents to offspring. If your family tends to face hair loss, it is possible that you are also going to face genetic hair loss. Usually, men suffer from hereditary baldness, but women also suffer from it. Women go through a wild roller coaster ride of hormonal changes throughout their lives. 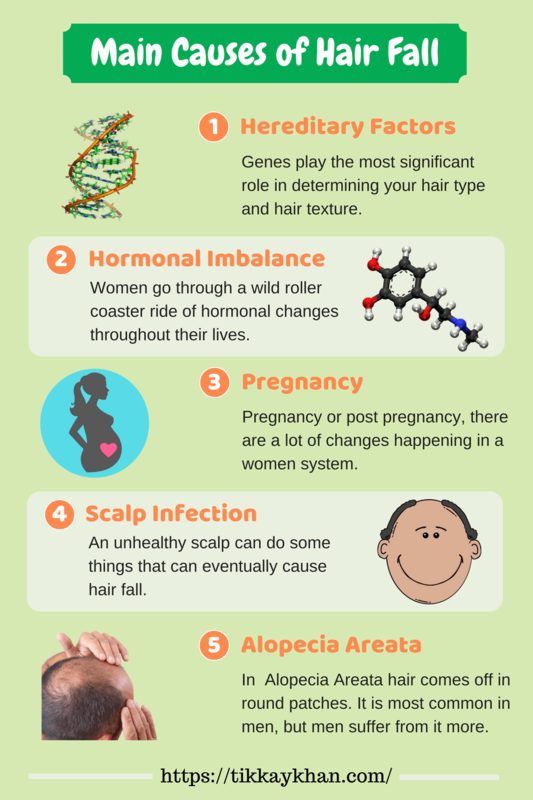 Hormonal changes are the leading cause of hair fall in women. Any hormonal irregularity can directly affect hair. Hormonal changes can weaken the hair strands and cause hair shedding. 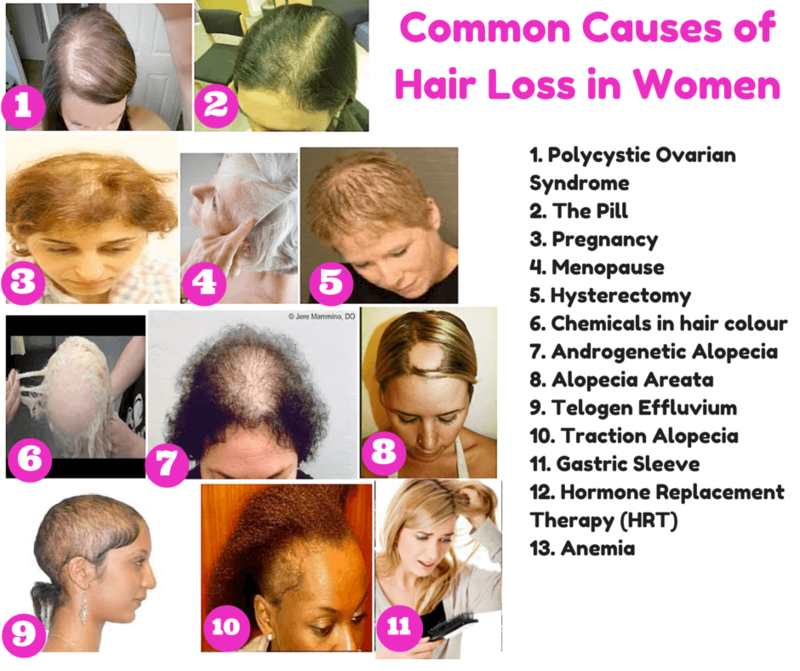 Polycystic ovarian syndrome, thyroid issues, and menopause reflects on hair health and can lead to hair fall. During pregnancy or post pregnancy there are a lot of changes happening in a women system. Postpartum depression PPD is a depression that women face after delivery. It can cause disastrous hair fall in women. Dehydration, body fatigue and stressing about newborn and women not taking hair care lead to chronic hair fall. An unhealthy scalp can do some things that can eventually cause hair fall. Be it bacterial, fungal or viral infection it can straightly weaken the hair root and cause hair fall. Seborrheic eczema or dermatitis is one of the biggest culprits of hair fall. In Alopecia Areata hair comes off in round patches. It is most common in men, but men suffer from it more. Alopecia Areata is an autoimmune disorder. An autoimmune disease is when the body’s immune system attacks the organ. In Alopecia Areata autoimmune system confuse hair strand with a foreign agent and strikes it. Alopecia Areata has no treatment, and sometimes it can be irreversible. Whenever you try to inquire about any hair expert about the causes of hair fall, the number one thing they are going to mention is stress. Stress is a killer to hair health. Any mental stress, depression, and anxiety can cause hair fall. Stress can make white blood cells WBCs to attack hair follicle producing hair fall. Use of any long-term medications and specific medication in general cause aside effect of hair fall. If you have any disease or medical concern and you go for treatment or surgeries to cure that. It sometimes heals the man issue but leaves a disastrous side effect of hair fall. Chemotherapy radiation treatment for cancer can weaken the hair follicle and can lead to baldness. Some steroids, antibiotics, cardiovascular drugs, anti-depressants can cause hair loss in men and women. Most of the drugs that can cause hair fall mention a warning on a label. Here are some medicines that can shed your hair. Everyone wants their hair looking good. To achieve perfect hair, the use of heat styling tool is widespread. Almost everyone has heat styling tools at home, and people are using it on a daily basis. Heat tools are damaging the hair cuticle and breaking the chemical bonds resultantly giving dry, damaged and weak hair. Heat Styling makes hair weak with repeated heat styling will eventually cause hair loss. Hair industry has grown a lot in the last few decades, and there are a lot of advancements in chemical treatments. From hair coloring to hair straightening chemical therapies can give you required result for short span of time, but in a more extended run, it can damage your hair. Damaged hair with repeated chemical abuse can provide no their effect than hair fall. Hair needs proper nutrition to grow and to be healthy. Any deficiencies of micronutrients and macronutrients can lead to chronic hair loss. Choosing any unhealthy ways to lose weight can cause weight loss. Starving, unhealthy food pattern and weight loss medication can alter the hormones, create some severe complication in the system and can cause a severe hair loss. 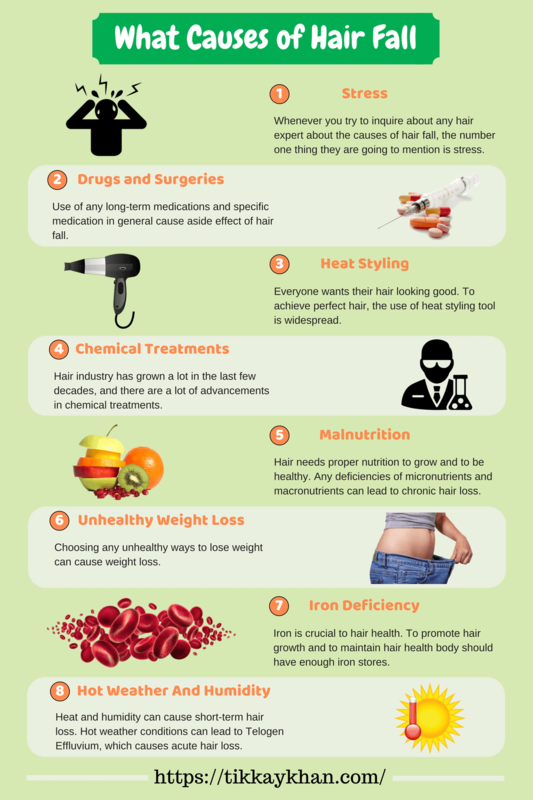 Iron is crucial to hair health. To promote hair growth and to maintain hair health body should have enough iron stores. Excess bleeding or Lessen Red Blood Cells RBCs in the body can cause hair fall in people of all age. Iron deficiency is a more common cause of hair loss in women. Heat and humidity can cause short-term hair loss. Hot weather conditions can lead to Telogen Effluvium, which causes acute hair loss. GOOD HAIR. Every single one of us craves for good hair. Hair that is fuller, healthier and lustrous.sadly not many of us have hair of our dreams. We all are facing hair complications be it hair loss, rough texture, hair thinning or baldness. All it takes to have good hair is proper nutrition and a little hair care, but 90% of people are failed to do so. Our dietary intake does not provide all those necessary vitamins that are crucial for hair health. Hair and skin are the last part where are all of our nutrition goes, but sadly nothing is left in our system to nourish our hair. Vitamins supplements are the solution to your hair problem along with some hair care. 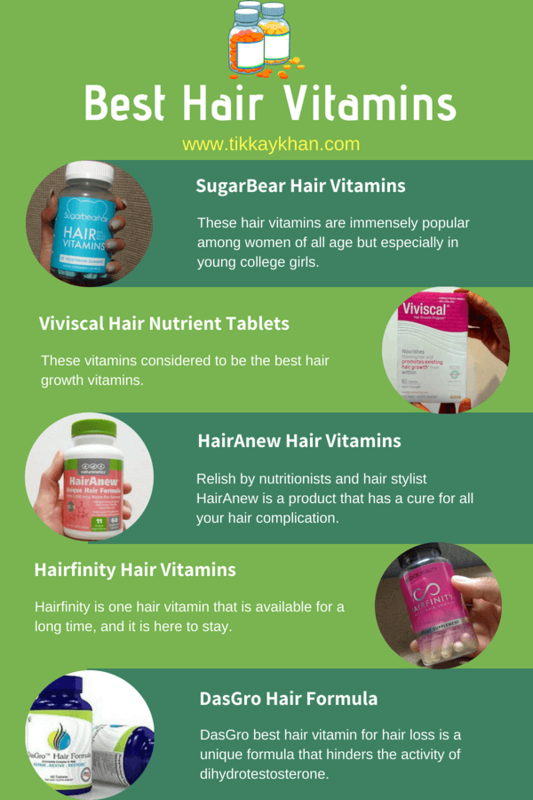 We are reviewing some of the best hair vitamin supplements of 2018 for all kind of hair concerns. We have featured best hair vitamins for hair loss and hair thinning to regrowth. So down here we are making it easy to select your pack of goodness that is best suited to you. Cult favorite “SugarBearHair” hair vitamins hit the market in 2016. It took the world by storm after all the big guns in the beauty community rave about its extraordinary result on their social media accounts and makes it best hair growth supplements. These hair vitamins are immensely popular among women of all age but especially in young college girls. Successful marketing of these fantastic hair vitamins has penetrated this product in the global market. Loved by Kardashian-Jenner clans these vitamins come in beautiful white and light blue packaging and has cute looking pills in a bear shape. Celebrities claim it to be best hair vitamin and it not just look appealing to your eyes, but it tastes super amazing. These gummies give you shiny and solid hair and will stop any hair loss. Sadly we are failed to have a balanced diet that has all those vitamins which are needed for all our hair concern ranging from hair thinning to hair loss and to improve the overall health and look of our hair.SugarBearHair vitamins are one hundred percent vegan and is an assimilation of different hair growth vitamins and specially made to deal with your all hair complication. All of us wish for voluminous, and lustrous locks. Beautiful and robust hair adds so much to our personality but truthfully saying not everyone has that naturally. We all need some help in the age where we are very far away from a balanced diet. If you issue is hair thinning and hair loss, We have got you covered by a vitamin pack of your specific need. Viviscal extra strength hair nutrient tablets come in simple packaging of white and pink and a claim written on the front of the box “Nourishes thinning hair and promote existing hair growth.” These vitamins considered to be the best hair growth vitamins. These vitamins fight the actual cause of your hair loss and fight it. These vitamins specialize in solving your hair baldness issue for men and women both. If you are facing a horrifying hair loss or have receding hairline, we got you the solution. These are the pills that are going to strengthen your thin hair strands, promote the growth of new hair, stops the breakage and makes your hair healthy and also works on improving your scalp condition and creates the environment for long lustrous, voluminous and damage proof hair. This wonder in the pills contains some unusual ingredients. It contains Biotin, Zinc, Vitamin C.Iron, Horsetail extract, and marine complex and millet seed extractAminoMar.AminoMar complex comes from different parts of marine animals. All of these ingredients make this vitamin different from all other vitamins available in the market. These are one of those vitamins which give visible result in reducing bald patches, regrowing your hairline and is not gimmick. These pills come in round shape and have no distinct taste and do not give any nausea to most of the people. It is recommended to take these tablets twice a day for six months although it starts giving visible results in two months. These pills are claimed to be entirely natural, 100% drug-free and can be taken by people of all hair type. We all are in the quest of finding something that gives us hair of our dreams. We all want sleek hair that is easy to style and manages. Environmental conditions, stressing and fast pace lifestyle and unhealthy eating picks are making hair loss a considerable issue globally. We are reviewing best hair vitamins for you to subjugate this issue. Relish by nutritionists and hair stylist HairAnew is a product that has a cure for all your hair complication. It comes in a solid white bottle with a green lid and has labeling in beautifully contrasted pink and green color.No one wants flat and lifeless hair. Every single one of us craves for volume in our hair. Hair thinning and breakage ultimately leads to balding which can shatter your whole appearance. HairAnew created by Naturenetics. Naturenetics has accompanied that promise you to give you completely natural products for your health concerns. Not very heavy on your pockets these hair growth vitamins strengthen your hair strands and prevent breakage. It rekindles the damaged hair done by excessive use of heat styling and abuse of chemicals on your hair. Kelp: Kelp is a super ingredient for your scalp health. It is loaded with essential nutrients mainly iodine, calcium, and iron. It also has a lot of vitamins that are best for hair growth and thickness. It is not that only women are facing hair problems or only women wants to have beautiful luscious hair. So many men go through alopecia and other hair troubles. We are not living in an age where beauty is only women’s business. Men are equally obsessed with self-care, and all of them wants a full head of hair. Hairfinity is one hair vitamin that is available for a long time, and it is here to stay. Hairfinity is the best hair vitamin in 2018 though it came in the market back in 2004.it is a consistent product from last 14 years and benefiting men and women all over the world. Introduced by husband and wife duo naming Broke Lawrence and Tai. They both keenly observed the loopholes of the beauty industry at that time and tried to come up with something new and something useful that works. They were well aware that the need to come up with a formula that is safe and not very expensive. Tai herself has experienced hair issue, so she exactly knows the problem and how it shatters your self-confidence. Back in 2004 when this product was about to launch a common concern associated with hair supplements were giving hair growth all over the body. The first thing they had to make sure was this product give you healthy strong hair only on your scalp and not on any unwanted area. All the constituents of these products are Food and Drug Administration approved and did not give any bad after effects. Masses and classes love this product. Comes in a sleek clear bottle with a black lid and hot pink labeling provides this product with a costly look. It includes Biotin, Vitamin A, vitamin C, vitamin D, B complex and Capilsana complex. It is an amalgamation of bioactive hydrolyzed collagen, MSM and horsetail extract. These vitamins tend to improve keratin and hair quality. It works on the follicle level and makes hair strong from root to tip. A perfect blend of all the right vitamins makes it the best hair vitamin for black and robust hair. If there any hormonal imbalance in your body damaging your hair and lowering your confidence. We got you covered, and we have a hair vitamin that is solely for that purpose. A culprit naming Dihydrotestosterone is shedding your hair. DasGro best hair vitamin for hair loss is a unique formula that hinders the activity of dihydrotestosterone and provides you breathtaking strong and fuller hair. Best hair supplement for men and women both and suited to all hair type. Comes in dark blue aesthetically pleasing bottle DasGro is hair goodness in a bottle. This USA made product claims to cure pattern baldness and hair loss. Its biggest complaint is that it ceases the activity of DHT that eventually stops hair fall. It provides you with all the essential vitamins that may be causing any hair and scalp related complications. The ingredients in these hair vitamins are very carefully picked to give you relief from all your hair worries. It has vitamin A, vitamin C, vitamin E, Vitamin B1 , vitamin B2, Vitamin B3, Vitamin B6, Folic acid, Biotin, Pantothenic Acid, Calcium, Zinc, Copper, Choline Bitartrate, Silica, Inositol, PABA, L-Cysteine, MSM, Ginkgo Biloba, Saw Palmetto, Pygeum Africanum, Green Tea, Grape Seed. Saw palmetto: Saw palmetto is berries, and their extracts are used to inhibit the release of DHT which is the number one cause of hair fall. Grape seed: Grape seeds are rich in vitamin E, and vitamin E is vital in the growth of new hair. Ginkgo Biloba: Ginkgo Biloba is a herb, and it has a lot of skin and hair benefits. It strengthens the hair strand and reduces hair fall. Green Tea: Green tea is full of antioxidants, and in the scalp, it works on follicle level and provides nourishment. Eating hair vitamin with devotion can make an evident change in your hair. Hair vitamins can entirely change your hair game and give you tons of confidence in your personality and satisfaction in your head. You need to explicitly select, do your research and carefully assess the ingredients that go well with your hair issue. Do not give up on them unless they are giving any side effects. Keep them regularly for a few months and see if they are making any change they are improving your concern take them for six months and stop. Hair vitamins can only solve issues that are associated with deficiencies or hormonal imbalance. Try to avoid heat styling as much as you can. Love your hair texture and wallah you will have the best hair.